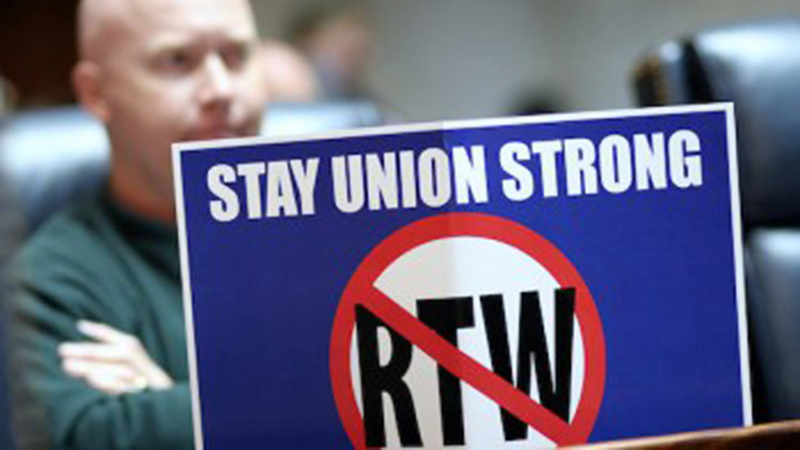 Sussex County is still on its march to implement a “Right-to-Work” law that would cover the county. At the Sussex County Council’s October 25 meeting Councilman Arlett’s ordinance was sent back for some revisions. It wasn’t drafted properly per County guidelines (meaning that it was drafted by some outside group) and sent to their Law Department for cleaning up/ The County’s Counsel had the opinion that the County did not have the authority to do this, but Arlett is committed to introducing this thing. He is committed to doing this even if it is of questionable legality and even if the defense of this will cost the county an arm and a leg. And while plenty of people are wondering why this is such a big deal in what is likely the most non-unionized part of the state already we have to remember that we have a local member of the 1% who is in a business whose profitability depends upon minimum wage and the GOP is probably looking to run on this in 2018. So get used to hearing Delaware’s GOP making the argument that Delaware’s workers should be paid less. And be paid less so that owners can make more. The final ordinance was finally introduced last night in Sussex Council. Supported by the Nazi-affiliated Ceasar Rodney Institute, naturally. Delaware’s Building Trades were out in force for each meeting to speak against this effort and could use our help in reaching out to our state reps to make sure they know we do not support Right to Work for Less. Middle-class families are already under attack by the GOP, if this passes, there will be fewer middle-class families in Delaware. I came here from a state with so called “right to work” laws, Texas. Median income, $55 thousand and change, with a huge petro chem industry that is largely unionized. Delaware’s….$58 thousand and change. The teachers unions are utterly toothless as are all the rest. It becomes a matter for the unionized there to beg and/or make deals for favors, pretty please. Delaware, Sussex, don’t do this. You’ll deeply regret it. There is no evidence for any benefit to right to work other than for the predators out there. It does not add to growth. No data proves this. Most of the employers worth courting to move here are already unionized and pay really good benefits which are at the heart of union work and not figured into the median income numbers above. Don’t fall for this crap Delaware. SuxCo spent six figures to defend the obviously unconstitutional practice of prayer before its meetings, so wasting money for no better reason than annoying The Libruls is established practice.